There are currently 31,582 users on this website. Here we have a gold medal unlike any that I have ever seen before. The medal was issued (I assume) at the Keel Laying Ceremony for the nuclear submarine USS Baton Rouge. The medal is 14 k gold, 31.6 mm in diameter and weighs 15.06 grams. It has a plain edge and a small loop. The design in both sides is incuse. 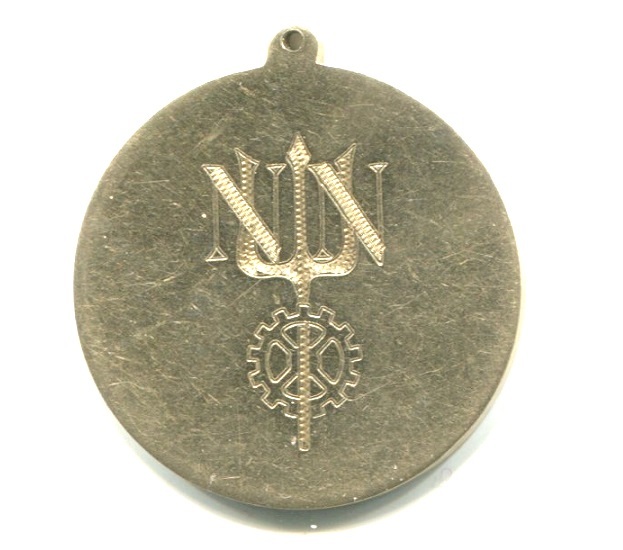 Obverse has a naval trident through a gear wheel with the letters "N N" on the prongs. The reverse is inscribed " USS BATON ROUGE SSN 689 KEEL LAID NOVEMBER 18, 1972 NEWPORT NEWS SHIPBUILDING AUTHENTICATED BY MRS. F. EDWARD HEBERT". The sub was launched April 26, 1975. It collided with the Soviet submarine "Kostroma" Feb. 11, 1992 damaging both ships in international waters and was decommissioned in 1994. Mrs. Hebert was the wife of Louisiana Congressman Felix Edward Hebert who served from 1941-1977 and died in 1979. I have seen similar ship launching souvenirs in aluminum covered cardboard but never one in gold. Being in gold makes me think that this piece may have been given to Mrs. Hebert. 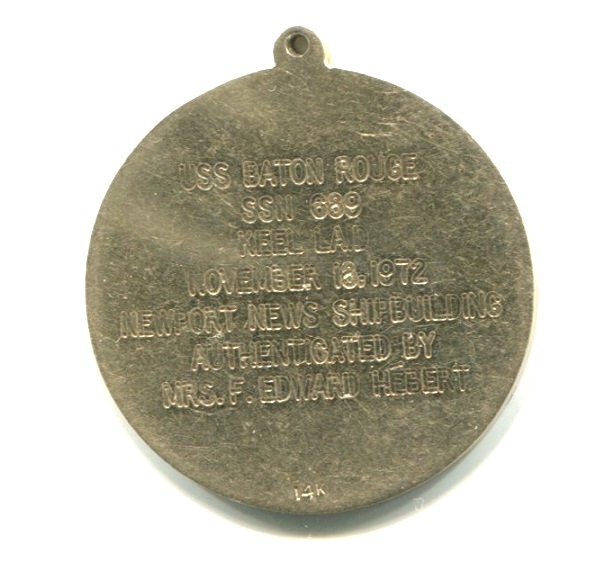 I wouldn't call it a medal but would refer to it as an engraved token (looks almost like a love token). Medals are usually die struck. This was obviously engraved. Might be worth something to someone that served on the ship. What a cool piece of naval history. the gear is the insignia of a navy engineman diesel and gas engines along with AC and refrigeration equipment. The NN interwoven with the trident are probably what we short timers in the navy would call a lifer in the sub service. 14K makes me thing of them having it made either for him self of wife /girlfriend as a pendant The ships page might have a crew list and you might find somebody with the double N initials Just my thoughts as I watch the ice forming on the wet snow outside. "N N" stands for Nuclear Navy. Thanks everyone. From Westernsky's comments I think we could start another topic somewhere else to define the terms token and medal.